Guess what happened over the weekend at our house? We finally installed the insulation and hardy backer in the shower in our master bathroom. The bathroom renovation is in full swing! Yay!! We are SO excited! After many, many months of demolition, delays and simply not enough time to get things done, we are making some wonderful progress on our bathroom! I am so thankful my husband is so handy. He did all of the work on the bathroom renovation except the plumbing thus far. Even though it has taken a long time, we’ve saved an incredible amount of money by doing it ourselves. We are finally are able to see how the bathroom is going to look when it is finished! I am loving it already. 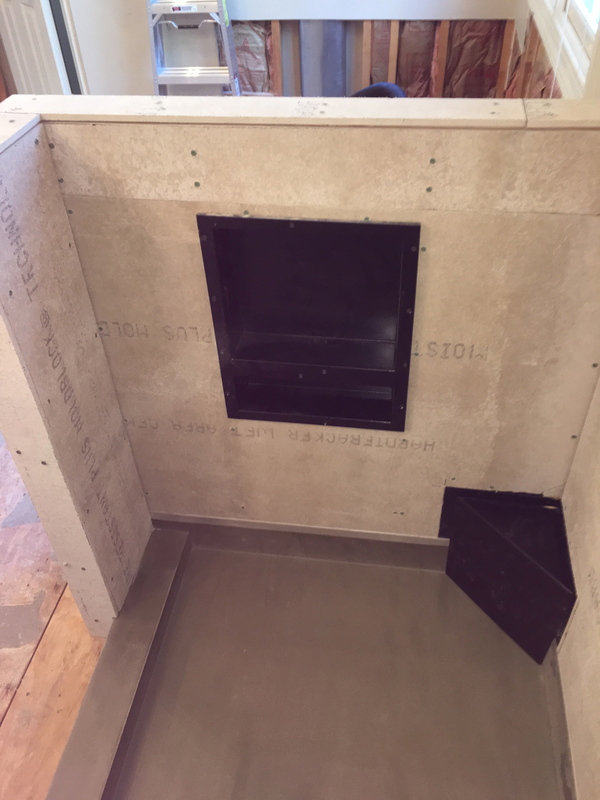 The Tile-Redi shower pan and niche system is terrific! (You can visit their website www.tileredi.com for more information and product line.) The pan is very light weight and you can adhere the tile directly to the pan. Once the pan was set in concrete, my husband attached the flashing making it ready for the next step. Below you can see the shower pan in place and the newly constructed half wall. We added a half wall to separate the shower from the tub area and included a niche to house shampoo and soap out of the way as well as a small corner bench. When the bathroom is complete the first thing you see when you walk in the bathroom will be the beautiful tub, shower and chrome fixtures. The new fixtures are polished chrome. We decided on Carrera Marble for the flooring and I think it will all tie in nicely together. This week we are getting quotes for the tile. Once the tile is complete the plumber will return and set the tub and fixtures into place. Slowly but surely we are getting there! Meanwhile we can see the light at the end of the tunnel. Can you see it? Happy to help. Send me a personal email at dellsdailydish@gmail.com with some info on your idea and I will shoot you back a few pointers that could help. wing chair with a contemporary black look. here and can’t wait to take a lok when I get home. Thank you so much for your kind words! My son and one of his business partners designed my blog for me. I think they did a great job too! Thank you for your kind words Marbella and so glad you are following along! Much appreciated! Hi there, I log on to your blogs regularly. Your humoristic style is witty, keep it up! Hi, thank you for commenting on my blog! Can you send me the name and information of your blog or website? Also, if you use any of my content and/or pictures I would kindly request full credit and a link back to dellsdailydish. Thank you!